While an open source ecosystem, freedom of customization and total control over your device have always been the essence of Android Operating System, providing timely updates and long term support haven’t been a top priority for various device manufacturers and if we’re being honest, there’s enough blame to pass around. The Android Engineering Team at Google hosted an AMA on Reddit a few days ago on which they constantly reiterated the need for faster updates to battle the fragmentation clearly predominant in the Android ecosystem. 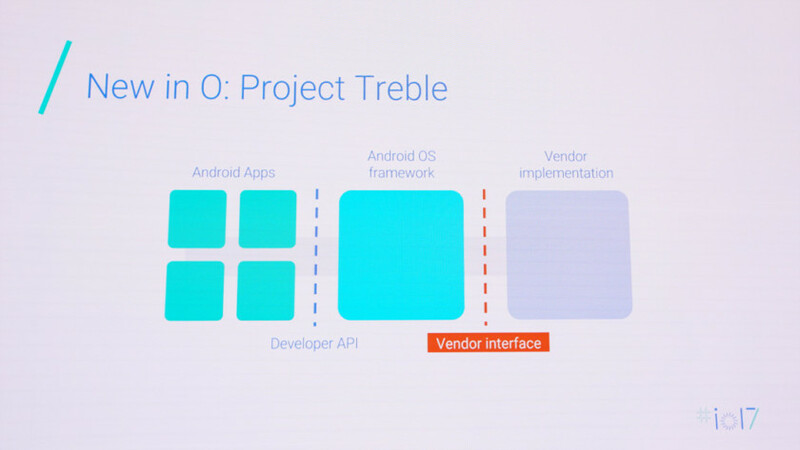 The team kept mentioning how Project Treble will be the cornerstone upon which the Android OS will now progress and prosper. For the uninitiated, Project Treble is Google’s latest take on presenting a unified and defragmented Android OS which will be integrated into all devices that launch with Android O or later. The project is Google’s biggest change to the low-level system architecture of Android to date shifting the very fabric of how updates are provided by device manufacturers. In general sense of understanding, the upgrading process works in two-tiers. Once the source code for an Android version (say, Android O) is published by Google, The chipset manufacturers (Qualcomm, MediaTek, and the kind) make some changes in the code to maintain compatibility with their System on Chips (SoC). Once the necessary changes have been made, the modified code is then forwarded over to the device manufacturers to build their devices in compliance with the code provided. While a few manufacturers refrain from making various changes to the code barring a few features and optimizations here and there, others add tons of new ‘features’ to the code, presenting their own take on Android OS. The device manufacturers also work in tandem with carriers to test and certify the new releases and then finally make it available to its users. 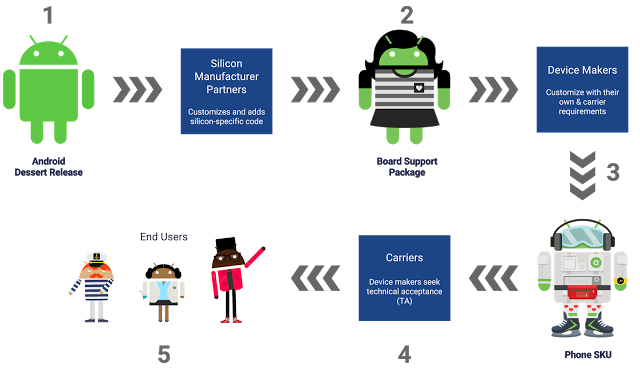 The current update process, as depicted above, requires constant support from both device and chipset manufacturer. Every time Google releases an update for your device, the chipset maker has to modify the code and send it to the device manufacturer who makes the necessary changes and forwards it to your carrier and so on and so forth. 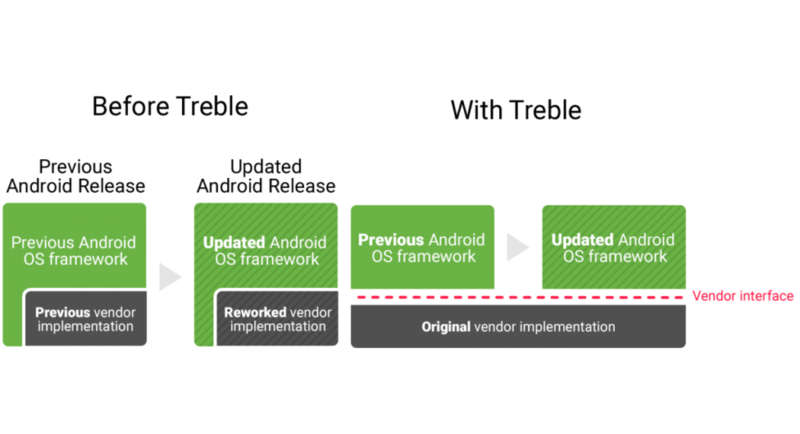 Project Treble removes the chipset manufacturer from the equation and enables device makers to deliver a new Android release to consumers by just updating the Android OS framework without requiring any additional work to the code. In addition to the aforementioned architectural changes, Google intends to directly take the code of device and SoC makers and move them into the common Android Open Source Project (AOSP) codebase for integration and updating purposes, saving them from the iterating process of implementing the same bug fixes and patches over every update that comes out. What people need to understand though is that Project Treble will only be compatible with devices that come out Android O out of the box. Implying that your devices running on Marshmallow and Nougat are probably out of luck (Google is currently testing it out on Pixel devices so you never know). What this means though is that come Android O, ‘every’ device will receive regular updates and ensure that fragmentation is a thing of the past. How the whole affair actually turns out though, is anyone’s best guess.